She made her maiden voyage from Birkenhead to Rangoon. In August 1914 she was requisitioned for trooping for the Indian Expeditionary Force and carried Indian and Burmese troops to the Persian Gulf before reverting to Bibby services in the following November. She was taken over under the Liner Requisition Scheme in March 1917 and served on the North Atlantic although two voyages were made for Bibby's during that time. In 1918 she carried troops to North Russia to assist the White Russians before repatriating Australian soldiers. 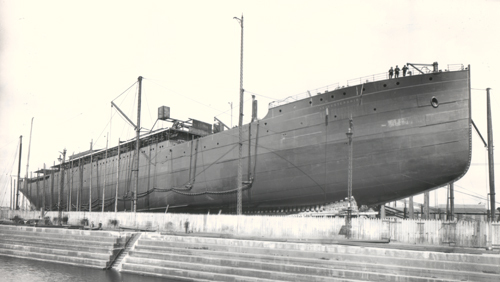 She was refurbished by Harland and Wolff in 1919 during which time she was converted to oil burning. As with all conversions to oil the coal bunker forward of the funnel was converted into cargo space and derrick posts fitted to serve the hatch. In 1930 she was sold to the British National Exhibition Ship Company, renamed British Exhibitor, and refurbished for her new role by Cammell Laird & Company of Birkenhead at a cost of £100,000. When the slump hit her owners went into voluntary liquidation in February 1932 and she was laid up at Southampton for a year. On 28th September 1933 she was purchased by the Cairo based Egyptian Company for Transport & Navigation and, as the Zam-Zam, was deployed on their Egypt to Jeddah service. In May 1934 she was transferred to Societe Misr de Navigation of Alexandria without a change of name. Laid up at Suez in October 1939 she resumed service on the Alexandria - Cape Town - New York service in February 1941. On 21st March 1941 she left New York bound for Recife where she embarked 202 passengers and sailed on 9th April. At 0545 on 17th April, although a neutral, she was hit by 55 shells fired by the German raider Atlantis in ten minutes during which around 24 lives were lost. Seven hours later she was sunk with three bombs along the waterline. The survivors were taken aboard the Dresden which proceeded to St. Jean de Luz. It later transpired that the commander of the Atlantis, Bernhard Rogge, recognised her as a Bibby ship and decided that she was disguised as a troopship.